This is one of those books that I use to size up other people. If you've read Dirty Work and you didn't love it, I wish you well but I doubt I want to know you. 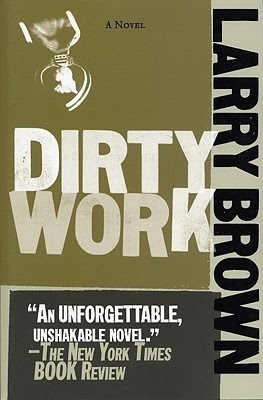 This was the first Larry Brown book that I ever read and, after re-reading it, it is still as powerful and haunting the second time around. The novel focuses on two Vietnam veterans in the VA hospital two decades after the war has ended, but the spiritual battle for these men goes on. Braiden, a black quadraplegic, has spent this entire time in the hospital and his imagination is his only means of escape. When Walter arrives under mysterious circumstances, Braiden thinks he's found his salvation. Walter's face was horribly mutilated and shell fragments lodged in his brain cause him to have uncontrollable "blackouts" from which he awakens with no memory. As these two men talk about their lives as they were and as they are, they revisit the painful landscape of Vietnam and Brown reveals how the war took much more from them than their bodies. The damage is emotional, spiritual, and mental; as Braiden says at one point, "It do something to you to kill another person. It ain't no dog lying there. Somebody. A person, talk like you, eat like you, got a mind like you. Got a soul like you . . . You look in somebody's eyes, then kill him, you remember them eyes. You remember that you was the last thing he seen." The novel also reflects how it was the poor and, in particular, the black soldiers who were asked to give the most and expect nothing in return--not even valid reasons for fighting. Brown's writing is simple, direct, and often bitingly funny when one least expects it. He knew how to capture the cadences and culture of working class Americans always one paycheck away from the brink of poverty and he always did so with the utmost respect, never denigrating or lessening their value to American society. When Brown died, we lost one of the finest writers of the American South and this novel is a testament to his gifts.